[i am a dekaphobic]: New Dishes from Osaka Ohsho! I recently visited the place with the best gyoza in town, Osaka Ohsho, to try their bestselling items and their newest dishes. For salad, we were served Osaka Ohsho Salad (Php 195 for half order, Php 330 full order) and of course, the gyozas: Original, Nori, and Cheese. We also had Ebi Chili (Php 375) and All Prawn Tempura (Php 375 for 5 pcs, Php 540 for 8 pcs). Osaka Ohsho recently introduced new Fuwatoro Tenshin Han Combination Offerings & Sets. I was able to try Fuwatoro Tenshin Han Curry Cheese Tonkatsu (Php 450). I love the mild flavor of the curry and how it blends with the fluffiness of the egg and Koshihikari rice. The cheese tonkatsu made it a lot better as well. A serving is good enough for 2-3 persons. Other combination offerings are Fuwatoro Tenshin Han Ebi Tempura, Fuwatoro Tenshin Han Chicken Karaage and Fuwatoro Tenshin Han Mabo Tofu. These are also available in sets (good for two). For dessert, we shared Banana Tempura with Homemade Japanese Ice Cream (Php 330). 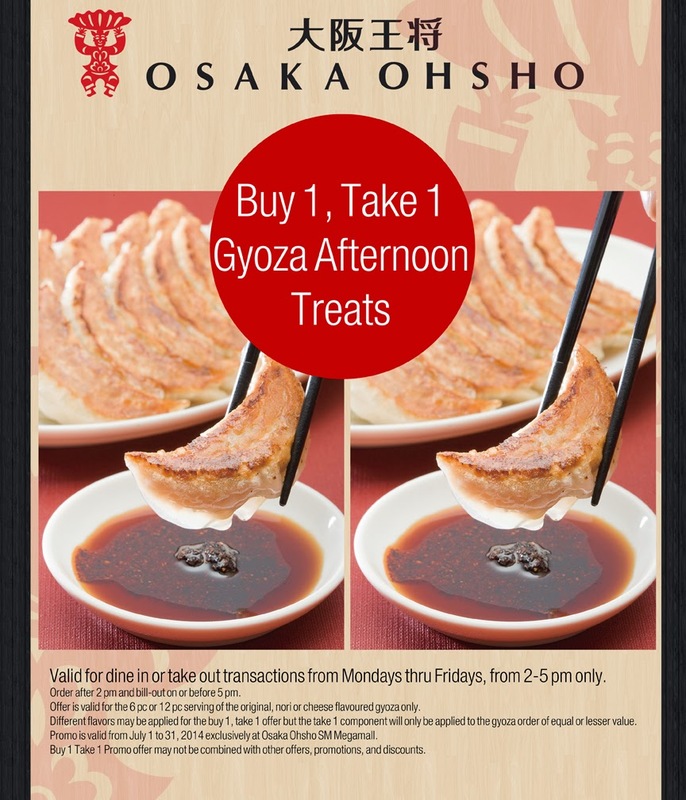 Until August 31, 2014, Mondays through Fridays, from 2pm to 5pm, every purchase of Osaka Ohsho’s 6 pc. & 12 pc. Original, Nori, or Cheese gyoza, you get another 6 or 12 pc. gyoza order of equal or lesser value absolutely free! This is valid for dine-in and take out transactions. Thanks to Bobby Vallar of Osaka Ohsho Philippines for having us. I had a love at first sight moment with the osaka ohsho salad then had an affair with the banana tempura with ice cream. looks so delish!